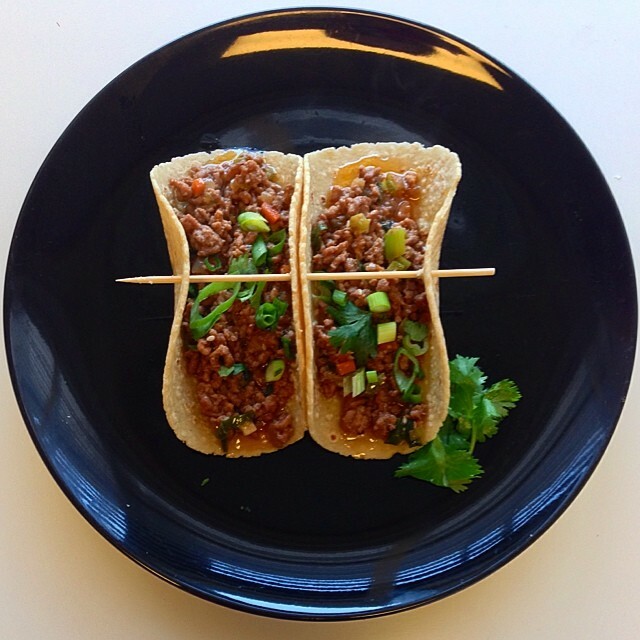 When Worlds Collide: Asian Beef Tacos – Pao Says, "Open Wide!" We ordered Thai food and had leftover peanut sauce. We also had some extra tortillas left over from the steak tacos I made a few days before, as well as a few carrots and celery sticks from a veggie platter we almost finished. With so much to work with, I felt the need to incorporate all of these items into a meal so they wouldn’t go to waste! Enter Asian Beef Tacos. In a large saucepan, cook the veggies up in some canola oil until the onions begin to turn translucent (med-high heat). Add the ground beef and break it up with a wooden spoon/whatever your kitchen utensil of choice is as it browns. once you see the meat and the veggies pretty combined and almost done cooking, pour in the soy sauce, the hoisin, and the peanut sauce. Add Sriracha to taste. At this point, decide if you want to add any salt to the meat- I added a pinch but do it to taste. Scoop the meat into a tortilla, garnish with cilantro, and you have yourself a delicious dinner! BAM! Yummy! I love finding ways to use leftovers ! Nice job!